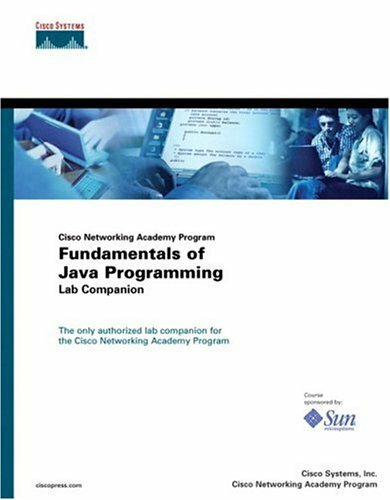 The only authorized lab companion for the Cisco Networking Academy Program's Fundamentals of Java Programming online course. Maps to the Web-based Java programming course sponsored by Sun Microsystems, Inc. Provides students with an introduction to Java programming from a universally recognized leader in IT education. Helps prepare students for the Sun Certified Programmer for Java 2 Platform exam. Approved and recommended by Cisco Systems, Inc. for the Cisco Networking Academy. The Fundamentals of Java Programming Lab Companion, along with the Fundamentals of Java Programming Companion Guide, complements the Fundamentals of Java course through the Networking Academy. This lab manual supplements the Companion Guide and offer labs to reinforce and support what the student has learned. It will allow the student the opportunity to perform all the lab tasks related to the Java Programming Web-based course, including the individual course project. The overall approach will be to provide students with a conceptual understanding of Object-Oriented programming, and to teach them how to use this technology to solve business problems through the use of hands-on labs. Students will learn how to create classes, objects, and applications using the language. This book also includes labs that will cover the language fundamentals and the Java language API (application programming interface). Upon completion of the course and through the use of this lab manual, students will understand the Java environment and the use of the Java Development Kit, Java language keywords and syntax. They will be able to create statements, implement Javadoc feature in their souce files, understand code writing that implements 00 principles and design pattern, and write code to invoke and define. This title will help prepare the student for the Sun Certified Programmer for Java 2 Platform exam.